Place the mangoes, yogurt, honey and water in a blender and blend until totally smooth. 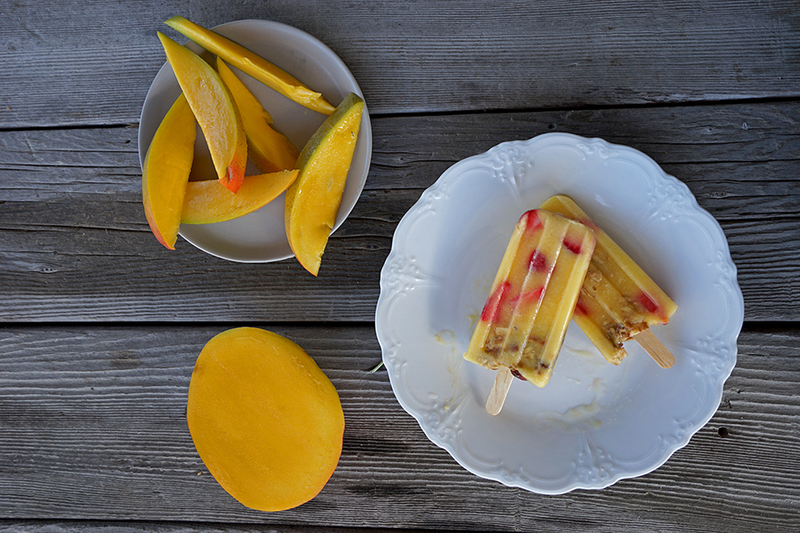 Pour the mango mixture in to the popsicle molds. Filling a little over half way. Place about 3-6 slices of strawberries into the popsicles molds pushing them down to various parts of the mold, bottom, middle and top. Moisten the granola with a little of the mango mixture and fill the remaining space of popsicle molds with the granola. Cover your molds and insert the popsicle sticks. Freeze for at least 6 hours before taking out. Running hot water over the outside of the popsicle molds is the easiest way to remove popsicles form most molds.